Last week, we started exploring the similarities between Marvel’s Peggy Carter and Doctor Who‘s Sarah Jane Smith, in terms of their roles as supporting and leading ladies. And then there’s Peggy Carter and Sarah Jane Smith. Bold and intrepid, they face danger unflinchingly, doing what must be done to save others. Where others may panic, they stay calm and figure a way of the situation. This, ultimately, is what makes them valuable both as supporting characters and as leads. 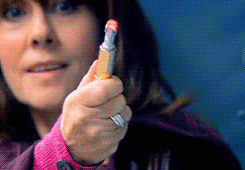 Sarah Jane lures her enemy into a trap. The first word that often comes to mind when we think of Peggy Carter or Sarah Jane Smith is “smart.” And they certainly have to be, considering their chosen fields! They’re the ones who realize something is amiss when their colleagues may scoff it off as nothing. They ask the right questions and get results, using their wits to get out of sticky situations and trap bad guys along the way. There are so many examples of their cleverness it’s hard to pinpoint just one as an example (though, Peggy disabling a super chemical bomb in her bathroom in the first episode of Agent Carter is definitely up there). But their appeal is not just about being clever – it’s about being able to recognize and value intelligence in others. In the scene from Captain America: The First Avenger above, Peggy admires Steve’s use of brains over brawn to outwit the other soldiers. She recognizes a kindred spirit in him, which is why she supports him before and after his transformation into Captain America. 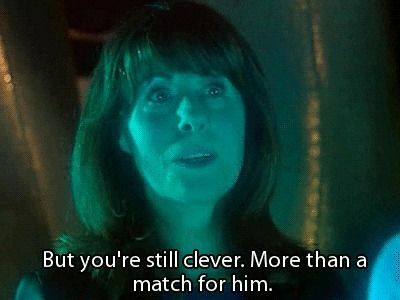 Sarah Jane constantly associates with intelligent people, from her first encounter with the Doctor, to her eventual friendship with Rose Tyler (who she addresses in the quote above), to her mentoring of Luke, Maria, Clyde, and Rani. In all of them she recognizes and admires their perception, which is often what earns her respect. She not threatened by those who are smarter than her, but instead helps to guide them towards the solution – the Doctor, after all, frequently gets lost in his own head. I’m not a fan of guns. Like at all. But in dangerous situations, being an excellent shot with anything, up to and including a gun, is a great quality to have. It also shows steady nerves and good depth perception, which are two things I can admire. Agent Carter is very adept with a gun, though her colleagues at the SSR would sideline her into secretarial work. And Sarah Jane, though against gun violence when she’s older, is also no stranger to a gun. Peggy and Sarah Jane can be said to have a lot of class. They know how to negotiate and flatter to get information. They know the truth can be damaging if put in dangerous or incapable hands. But never let it be said that they don’t know how to speak their minds! These British ladies don’t put up with nonsense, not from enemies, not from friends. When given the opportunity, Peggy and Sarah Jane know how to take control of a situation, to come up with a strategy (or at least be willing to improvise) and take the lead in order to save the world. In wartime, Agent Carter has quite a bit of authority – as liaison from the British Government to the the Strategic Scientific Reserve, she supervises all operations for Project Rebirth. After the war and a brief stint in the S.S.R., she becomes founder of S.H.I.E.L.D., an organization that stays strong for nearly 70 years. In the scene from Agents of S.H.I.E.L.D. above, Peggy Carter cooly interrogates a HYDRA scientist. This is a great example of why she is effective as the founder of the S.H.I.E.L.D. organization – she knows how to get information, how to command a room even when she doesn’t possess all the information. She is willing to concede when she doesn’t know, but makes it clear that she will get it, one way or another – no excessive force or giving in to demands necessary, just a strong will and keen perception of others. She is also a great strategist and tactician, though not shown in this scene, and it is implied in Agents of S.H.I.E.L.D. that she is the reason that HYDRA didn’t rise to power until Captain America: Winter Soldier – fear of her leadership kept them at bay for decades! 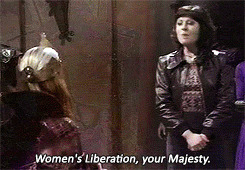 In the scene from Doctor Who above, Sarah Jane takes control in an early encounter with the Doctor. She asks the right questions, evaluates the situation, watches for signs of manipulation from the Doctor. Once she judges he might be trustworthy and possesses necessary insights, she is willing to defer to him, but not completely – a good leader knows when to let others lead. Here she is in an unfamiliar time and with less knowledge about what’s going on, but still she is able to take charge and gather information. She retains this quality when separated from the Doctor, and as the leader of her “Scooby gang” on The Sarah Jane Adventures. Though they’re tough as nails, Peggy and Sarah Jane are also compassionate, even towards those who are cruel to them. In the scene above from Agent Carter, Peggy nearly sheds tears for one of her colleagues after his death. * Though he was a misogynistic jerk to her, she still feels bad that he is gone, showing that she values him as a person, even if they didn’t get along. Peggy has also shown compassion for Steve, when he told her about his struggles with feeling weak, and her colleague Daniel Sousa, when he talked about his war injury. Notably, she is never pitying or patronizing to them. She shows sympathy (and, in Steve’s case, empathy) for their struggles, but also shows respect for their strength of character. Sarah Jane, in the clip from “Revenge of the Slitheen” above, tries to spare the aliens that wanted her dead from annihilation. 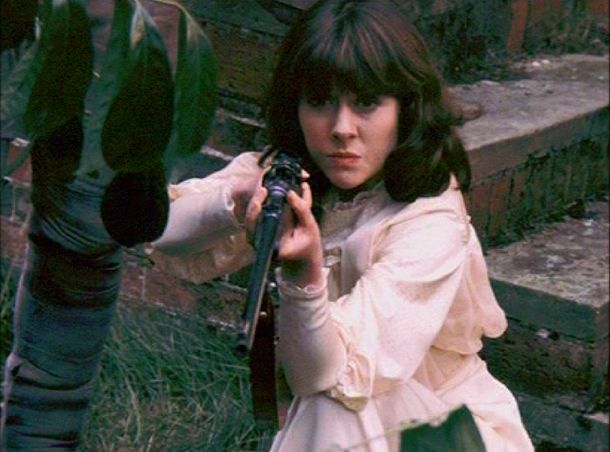 Though Clyde and others would chide her for showing mercy, the audience can admire Sarah Jane’s compassion and value of life, human and alien. She’s a little like the Tenth Doctor in that way – she’s willing to give someone a chance, though not to the degree of being taken for a fool or giving endless second chances. She often shows sympathy for enemies driven by loss or pain, though she still must take action against them. She tries to neutralize threats in as nonviolent a way as possible, and that sets her apart. 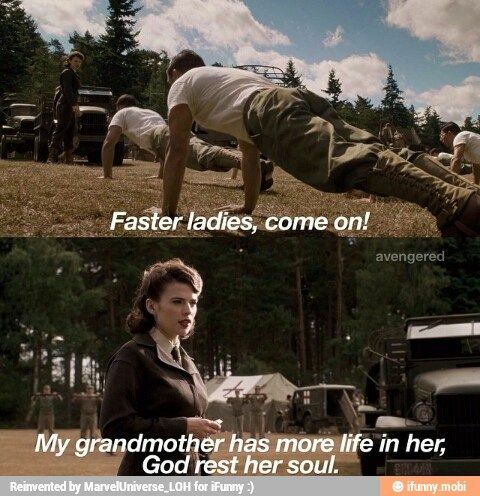 And this is probably my personal favorite aspect of Peggy Carter and Sarah Jane Smith. As protectors of the world, they of course make an effort to protect everyone. But they are particularly fierce in their defense of other women. Peggy Carter, though she lived in a decade when women had quite a bit of relative power and freedom, also faced many challenges as a woman in the intelligence industry. She is quick to prove herself as a capable soldier and strategist, but is still underestimated by her male colleagues. But what’s important is that she doesn’t just look out for herself – she looks out for other women too, as in the clip above. She values herself and other women as worthy of respect, and actively defends against sexual harassment when she can. 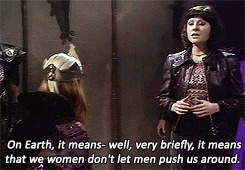 Sarah Jane Smith, as a girl who came of age during the women’s liberation movement, strongly represents its values in her travels through time and space (I mean, she makes her first appearance in a pantsuit). She is quick to point out when men are being backwards and oppressive, and to empower women she meets in bad situations. This continues long after her time on the TARDIS has ended – in the final episode of The Sarah Jane Adventures, she recommends a cleaning woman who helps her on a mission to work at U.N.I.T. (goodness, so many acronyms in this article). What is interesting in both Agent Carter and The Sarah Jane Adventures is that their lead characters, having no female friends when they were supporting characters (though Sarah Jane does sort of befriend Rose and other modern companions in her appearances on the reboot), find female friends in their own shows. Which means more opportunities for female empowerment and passing the Bechdel Test! 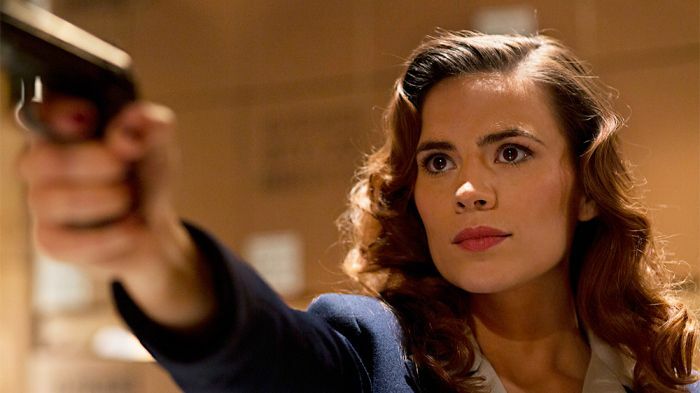 Peggy Carter’s modern incarnation follows in the tradition of Sarah Jane Smith. Their strength, resourcefulness, and compassion has caused them to rise to the status of leading women in their own shows, which causes an opening for more women’s stories to be regarded as the central narrative in television, in film, in literature, and so on. Peggy and Sarah Jane remind us that men’s stories shouldn’t be the default, and women’s stories can be meaningful and powerful. Watch Agent Carter on ABC, Tuesdays at 8/7c. You can find episodes of The Sarah Jane Adventures on Youtube, Amazon Prime, and Hulu. 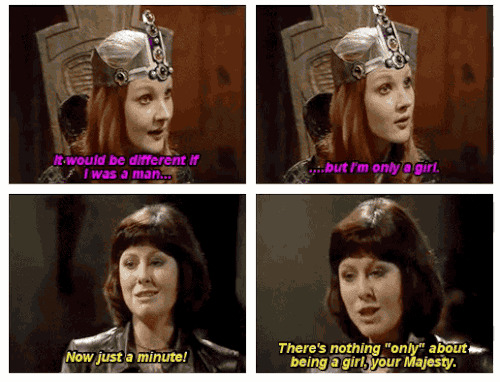 This article is dedicated in memory of Elisabeth Sladen, the actress who brought Sarah Jane to life. Rest in Peace. That’s all for this week! 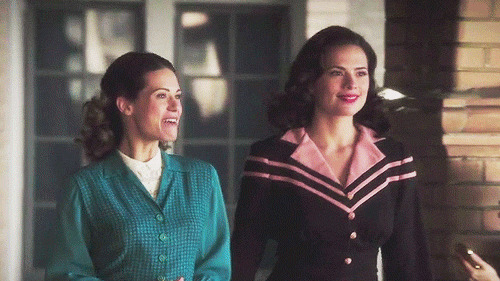 Hope you enjoyed it, and let me know in the comments what you love about Peggy Carter and Sarah Jane Smith :). Learn more about the blog here, about me here, and resources here. Check out the links for related works and Pinterest boards.